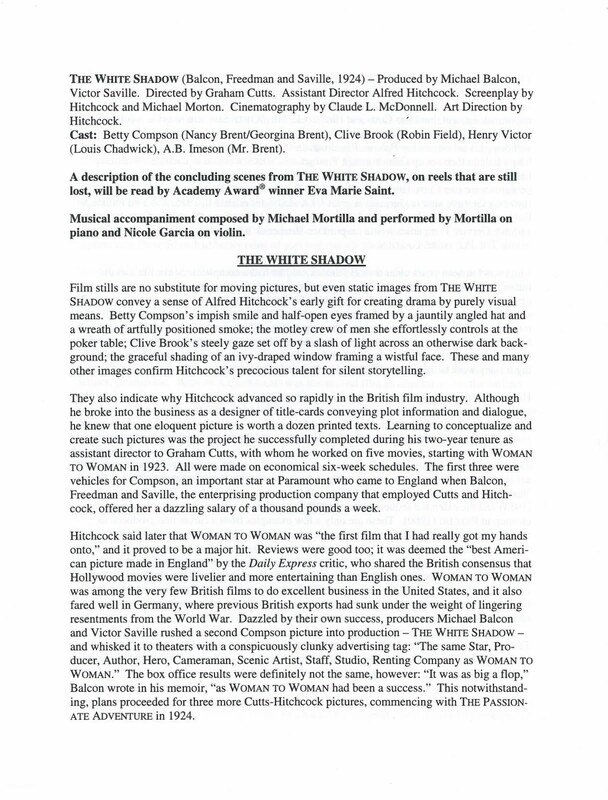 Program from the re-premier of The White Shadow. Click twice on this and all subsequent images and make them instantly bigger! By guest blogger Pat McFadden. 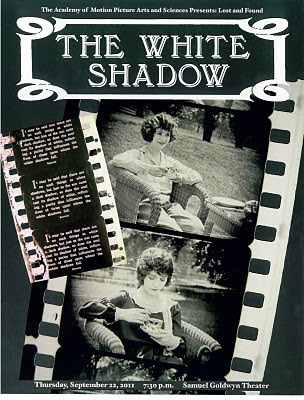 On Thursday, September 22, the recently discovered reels from The White Shadow (1924), a film from Alfred Hitchcock’s days as Assistant Director for Graham Cutts, were re-premiered at the Motion Picture Academy’s Samuel Goldwyn Theatre in Beverly Hills. I was fortunate enough to acquire tickets for myself and a few friends, and had the further fortune of sitting in the front row. (This was somewhat due to necessity, as the entire middle section of the theatre was reserved for VIPs with the exception of the very first row.) Front row at this particular theatre is usually too close – but for this night, with two musicians and a panel of six, I simply could not have had a better position as a non-VIP. I had full view of the stage and could turn around for perfect view of any notable who’d been asked to stand in the audience. 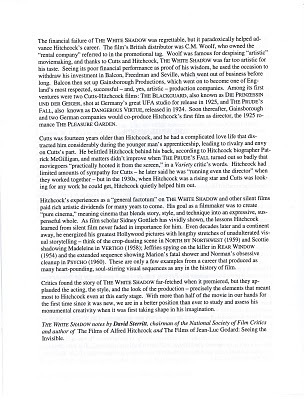 As usual, an extravagant and beautiful program had been printed for the evening, with a paper insert of notes on Hitchcock’s role(s) on the film, and its place in, and effect on, his career, well written by Hitchcock Author David Sterritt. Randy Haberkamp, the Academy’s Director of Educational Programs, and always an entertaining, witty and knowledgeable Master of Ceremonies at Academy screenings, began the evening asking for a show of hands from those who identified themselves as “optimists.” He went on to correlate this to the fact that they were about to show us only the first half of a feature, and urged us optimists to look at the experience as “half full” and not “half empty.” He then asked some people in the audience to stand so we could gaze at them and applaud, among them were Norman Lloyd and Eva Marie Saint (both of whom would be on the panel later), Ed Lauter (Maloney in Family Plot), Diane Baker (Lil Mainwaring in Marnie), and Veronica Cartwright, with her hair pulled back in a pony tail, just like her younger self as Cathy Brenner in The Birds. 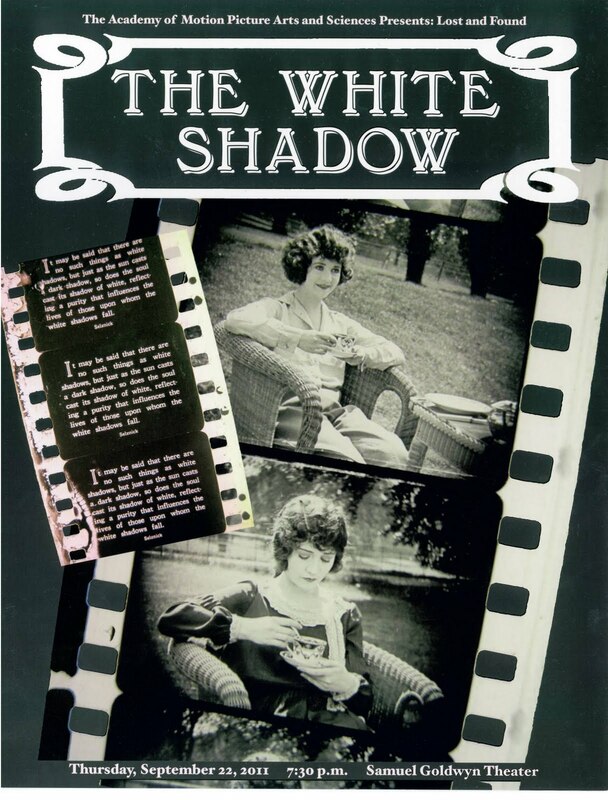 The screening got underway, starting off with two shorts which had also been discovered and rescued, one with Mabel Normand from 1914, the other with Monty Banks from 1923, and then the existing first half of The White Shadow. The amazing Michael D. Mortilla accompanied the entire evening on piano, with an original score that is simply magnificent. Joining him for the feature only was the excellent and lovely Nicole Garcia on violin. 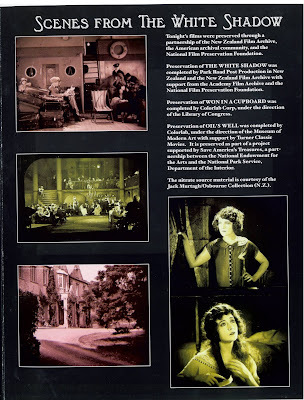 The original opening credits did not survive (as we were to learn from the discussion later, the first few feet of any reel of nitrate are usually the first to decompose). 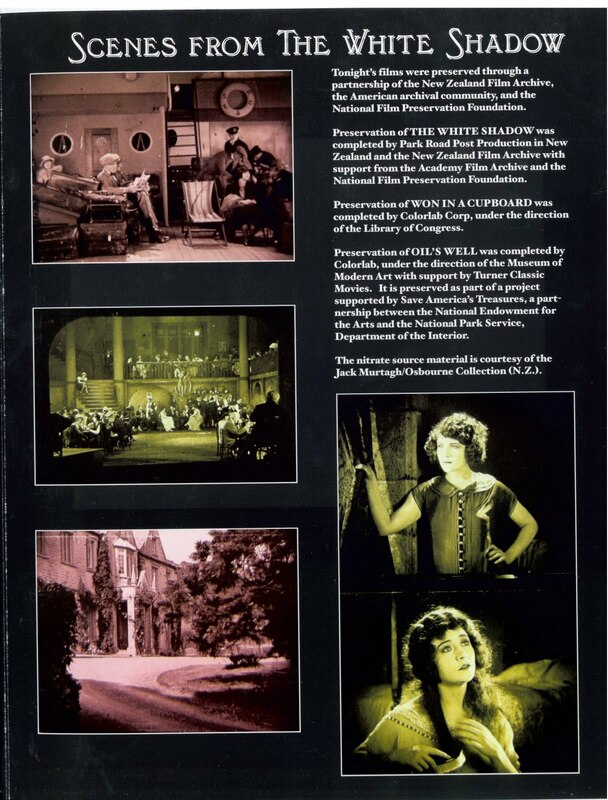 Therefore the film began with a still shot of one rescued but damaged frame of the opening inter-title – this can be seen on the program cover – followed by a simple list of credits. More may be missing from the opening but it didn’t seem like it could be much, as the story seemed to be in place: Nancy Brent (Betty Compson) meets Robin Field (Clive Brook) on deck of the ship that they are both taking back to London. They get along and plan to meet after they’ve settled back at home. Nancy is welcomed home by her family: alcoholic father, doting mother, and identical twin sister Georgina, also played by Compson. A double was used for some shots, but the many scenes which utilized the splitscreen effect were quite seamless and accomplished for the period. Compson was excellent in both roles, and stunningly beautiful (she would work for Director Hitchcock some18 years later in Mr. And Mrs. Smith, as Robert Montgomery’s bombastic blind date Gertie, the smart-mouthed blonde with the sure cure for nosebleeds). But we now learn that these identical twins are not at all identical in character, and Nancy is as selfish and wanton as a female character was allowed to be in 1924. She quickly sends her unsuspecting sister to the pre-appointed place that she herself had agreed to meet Robin, for the sole purpose of his being baffled at not being recognized by the girl he thinks is Nancy. Several more episodes at the family’s country manor prove that despite the pleading and placating of her sister and parents, Nancy is rotten to the core. Unsatisfied with her boring life at home, Nancy leaves a short note for her sister and steals away without a trace. Blaming himself, her father, already unstable from too much drink, goes out in search of her; neither are found. After her mother dies of a broken heart, Georgina is now left alone. Reluctantly abandoning the search for her sister and father, Georgina continues to see – and falls in love with - Robin, still letting him believe that she is Nancy. Nancy, it is now revealed, has become a card playing, smart dressing drinker in Paris, spending her time winning things from men (all implications) in a place of ill-repute called the Café of the Laughing Cat (see picture on page 2 of program – this beautiful set, centered by a man-sized cat statue that brings “The Ten Commandments” to mind, could well have been the young art director’s proudest creation for this project.) In the first of several contrived coincidences, Mr. Brent, the twins’ father, is seen at the same club – now unrecognizable as a wandering tramp who has lost his mind from drink and desperation. This scene is the most lighthearted so far. A lengthy inter-title card explains the rules of the Laughing Cat Café: As each new person enters, the wild patrons shout "GET OUT!" The persons who don’t run screaming are considered worthy to stay. This was charming British humor in an otherwise serious and engaging melodrama, and suspiciously Hitchcockian. Back in London, Robin and “Nancy” are engaged to be married – but Robin’s good friend Louis Chadwick (Henry Victor) will soon (coincidentally!) visit the Café in Paris and see the real Nancy holding court. Henry visits Robin, tells him what he has witnessed, and that it would be a disgrace to marry this woman. Unwilling to believe it, Robin dares Henry to take him to Paris and prove it to him. Georgina, overhearing all this, realizes that Henry has unknowingly located her long-lost twin, and she rushes to France as well, hoping to find her there. We return to the Laughing Cat Café, where all of our major characters are now gathering, and just as good-twin Georgina enters (meaning that Nancy, Robin, and Louis are about to be shocked out of their minds to see her there) -- the reel ended and the curtain closed. There was a huge collective groan from the audience. Chalk another one up for the Master of Suspense, but in a way he never intended. 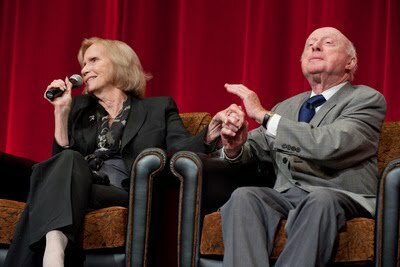 Eva Marie Saint rushed to the podium on the stage, where, after cheerily muttering “Well, I don’t understand it, but I still don’t understand North By Northwest,” she read to us a synopsis of the conclusion of the drama (from the film’s U.S. 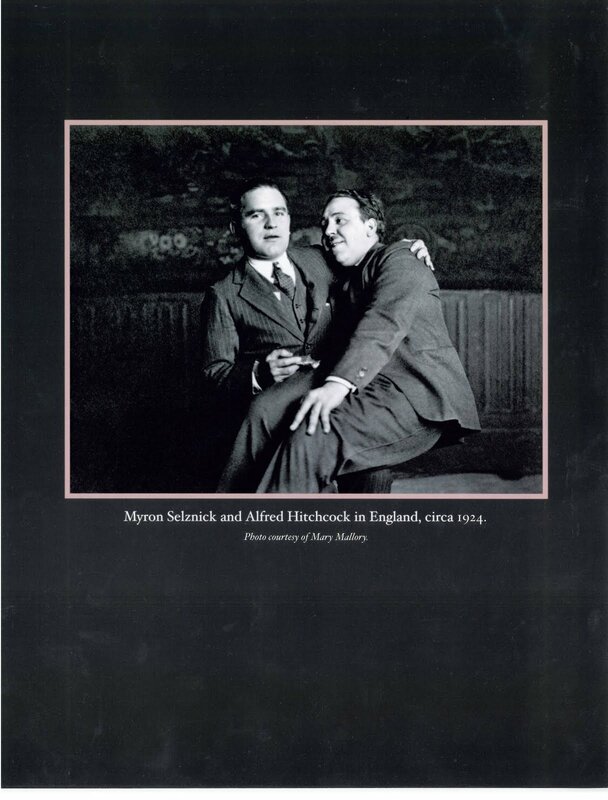 Copyright Registration), humorously accompanied by more melodramatic piano and violin. Click to enlarge fellow Hitchcock geek David Sterritt's program notes. 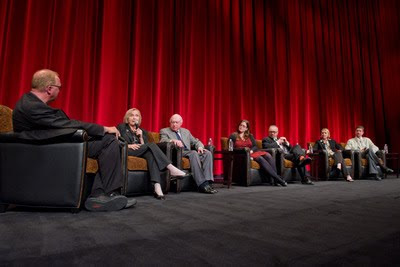 Now the panel gathered onstage to great applause, moderated by Academy Director of Special Projects Randy Haberkamp. Asked of Frank Stark: "Why does it happen to be New Zealand that so many of these films are being found?" “The real question is why did they disappear everywhere else?” Frank quipped, and then explained that New Zealand was the end of one of the distribution shipping chains, and after exhibition, rather than shipping the prints back, which was costly, distributors were asked to destroy them. Many of these workers, including some projectionists, secretly stole away with prints, unable to bear with the thought of destroying them, and Frank fancies that many were enjoyed at private collector parties. Thus, a great deal of film has been re-collected over the years. Annette Melville explained the role of the NFPF as sort of a “match-maker” – they don’t hold films, but they work on behalf of the American archival community to locate and preserve endangered works. The Mellon Foundation gave them a grant enabling them send a two-person team to New Zealand, which has succeeded in identifying over 165 titles, going through 225,000 feet of nitrate film, and that’s just the silent material. 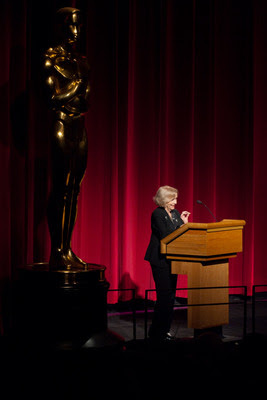 Annette handed the mike over to Leslie Anne Lewis, who held us captive with her fascinating “detective story:” The film was in a couple of reels labeled “Twin Sisters,” but the original credits were gone, and it had been placed in the American section due to the fact that the Selznick logo was on it (every inter-title had “Selznick” at the bottom, as seen in the frame blow-up on the program.) Intrigued by the beautiful images, she concentrated her research one evening on identifying this film. Cross-checking the identified cast members with other clues, she eventually narrowed it down to two possibilities, and since one of them had the Hitchcock name attached to it, began researching what he had been doing at the time. 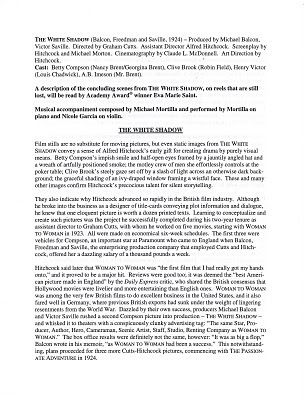 As there is no shortage of Hitchcock-related study on the internet, this led to the happy confirmation of what had been found. My personal assessment of the evening? Perfect. Of the film? Most people seemed to agree with me that what we saw was a first-rate production of a rather silly story. If this first half had been summarized for me, sight unseen, I doubt that I’d have anticipated being as engaged, entertained, and yes, even emotionally involved. 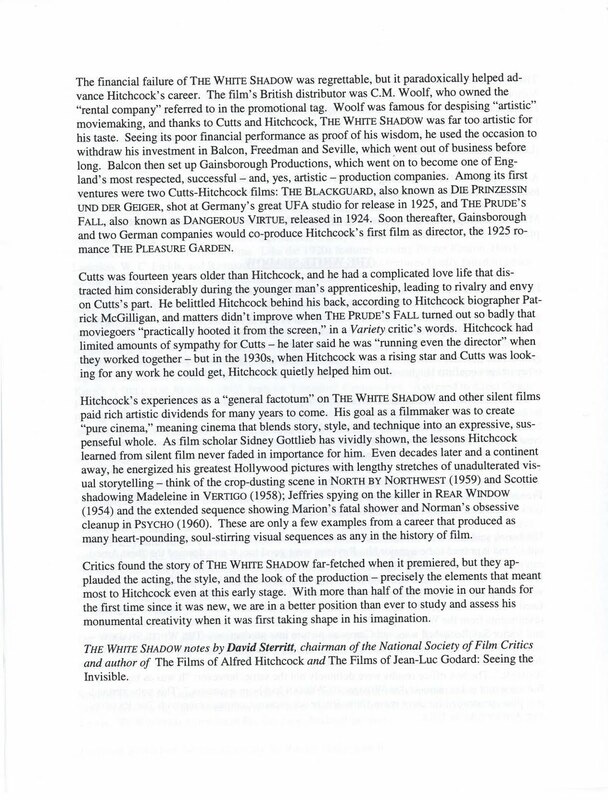 It’s impossible to know, but not at all difficult to guess, how much of that was due to accomplished director Cutts, and how much to the hard work of a young and eager assistant director, editor, co-writer, art director, and title designer. So, despite how convoluted the second half sounds, I assume it maintained its dignity, and hope that it might be found in another mislabeled canister somewhere, someday.